Fresh content on any site is a good thing. A nice touch is to display your most discussed posts to your website visitors. In the case of WordPress, a widget is the ideal place for this. Users who wouldn’t otherwise know where to go after reading the current post, might check out and hopefully participate in your blogâ€™s most commented posts. Your most commented on posts are commonly also the ones which bring most page views and are the most interesting. 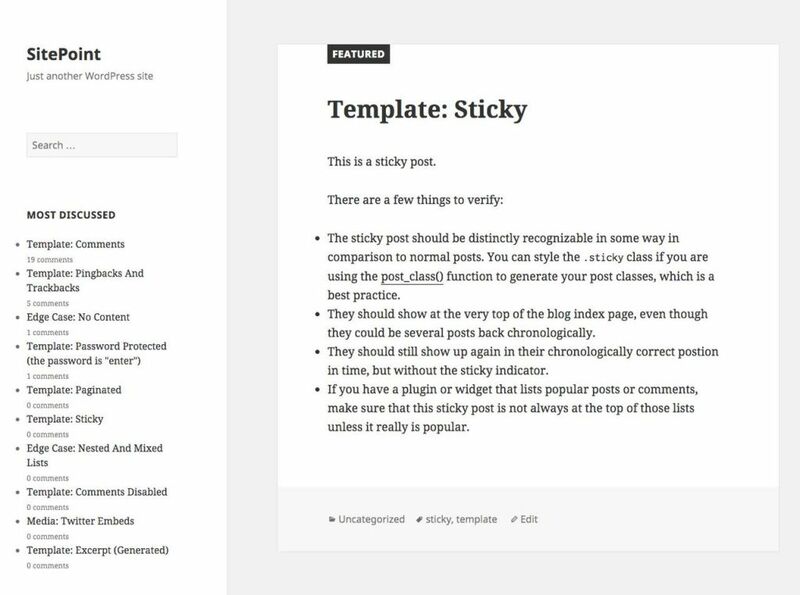 In this tutorial we will create a basic plugin to display most commented on posts in a widget. Although there are lots of plugins available for this purpose, many of them tend to be overwhelming and also donâ€™t support caching. In this article, the plugin we’ll build will be lightweight and will cache the top 10 commented posts for 24 hours. In the most-commented-widget.php file, add the following text to make the plugin installable. We will use the get_posts() function instead of the WP_Query object to retrieve the most commented on posts, because using WP_Query directly alters the main loop (i.e., global $wp_query variable) which would cause site issues. The get_posts() function is used to retrieve an array of WP_Post objects based on a set of parameters. get_posts() internally uses WP_Query objectâ€™s query function to construct a MySQL query and execute it. WP_Query objectâ€™s query doesnâ€™t alter the main loop. The Transients API is used to store key value pairs of data, just like the Options API, but with an expiration time. The Transients API stores the data only in cache if persistence caching is configured. Therefore the Transients API is great for caching data. We will use the Transients API to cache our most commented posts for 24 hours. We are registering the widget class using the register_widget function which is called inside the widgets_init action. The widget function of our Most_Commented_Post_Widget class is responsible for echoing the front end output. At present, we’re just displaying the title on the front end. We’re calling the get_posts function with orderby, order and posts_per_page array keys. We are retrieving the top 10 most commented on posts in descending order. And then we’re using a foreach construct to loop through the array of the WP_Post objects. We’re then displaying the title and the number of comments. But we haven’t started caching the result, yet. Letâ€™s see how to cache the get_posts() result. Here, we’re storing the resultant array as a transient with a expiration timer for 24 hours. If the transient returns false, then we’re running the query again and storing the result as a transient for next 24 hours. Now the plugin will play much nicer with MySQL. Letâ€™s style our widget to look more professional. Put this code in the plugin file to enqueue the style.css file. Place this code in the style.css file to style the lists and add some margin. In this article Iâ€™ve shown you how to easily build your own Most Commented On Posts plugin for WordPress. You can now go ahead and expand on this to display images and add more information. Please share your experience with your own plugins below. Narayan is a web astronaut. He is the founder of QNimate. He loves teaching. He loves to share ideas. When not coding he enjoys playing football. You will often find him at QScutter classes. For the sake of non-technical users, a link to download the plugin at the end of the tutorial will be very much appreciated. I will update the article with a link to download the plugin directly.